THIS Government has often been accused of engaging in too much spin – but this time there’s no doubt. 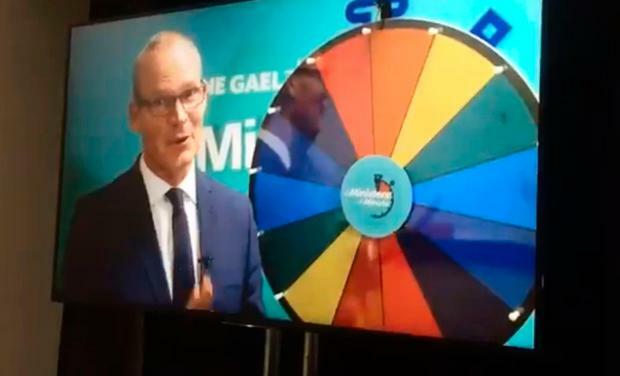 Delegates at Fine Gael’s Ard Fheis this weekend were treated to a four-minute video of their best and brightest taking part in a ‘spin the wheel’ game where they faced questions on the Eurovision and whether pineapple on top of pizza is a good idea. The cringeworthy video was described to the membership as Fine Gael’s answer to Winning Streak. Housing Minister Eoghan Murphy was the only member of Cabinet to know how many times Ireland won the Eurovision. We learned that Tánaiste Simon Coveney has a cat called ‘The Holy Spirit’. And Communications Minister Richard Bruton informed us that putting pineapple on pizza makes everything "soggy and horrible". But Business Minister Heather Humphreys thought otherwise. As for whether the ministers would rather fight 100 duck-sized horses or one horse-sized duck, you’ll have to watch the video to find out. Independent.ie has decided the obvious winner was new Education Minister Joe McHugh - who missed his recording slot because he was in the Dáil.